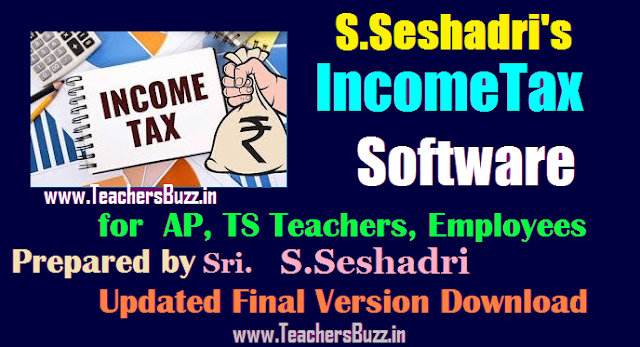 S.Seshadri working as math teacher at high school level has been released Income Tax Software FY 20018-19(AY 2019-20) for all salaried govt employees of Andhra Pradesh and Telangana States. Just entering the basic pay and increment month, and certain deductions one can get full details of salary details(Annexure-I) as well as income tax particulars(Annexure-II), Form16, Rent Sheet, 10E Form. The software is enriched with VBScript in order to get printout directly without navigating File  Print. We hope all State Govt. employees can use this software and take printouts and same can submit to the concerned DDOs. In Budget 2018, Finance Minister has proposed Rs.40,000 standard deduction, which is a fixed amount and helps to reduce tax burden to salaried persons as well as pensioners. This standard deduction not useful to family pensioners. For the tax purpose, one can reduce Rs.40,000 from their gross salary. Previously we were getting tax rebate to the transport allowance and medical allowance. These two are generally deducted from the gross salary. Now instead of these two, Rs.40000 has been given as standard deduction as per the amendments to Section 17(2)(viii) of the Income-tax Act, 1961. By availing the Rs.40000 standard deduction tax payers, who fall in the 5% tax slab can save only Rs.2080/-, those who are in 20% slab can get Rs.8320/- as deduction. In section 80C of the Income-tax Act, in sub-section (1), for the words one lakh rupees, the Amendment of words one hundred and fifty thousand rupees shall be substituted with effect from the 1st day of section 80C. April, 2015 .